It looks like all the hard work, political frustrations and financial investments of the Westside Community Improvement Association (née Jefferson School Committee) have paid off. In a press release issued today, the group announced that it and the Redwood Community Action Agency have received a whopping $3.3 million grant from the California Department of Parks and Recreation. The money will go toward construction of a community center and park at 1000 B St. If you'll recall, in 2010 the City of Eureka was all set to purchase the property, which has been closed since 2005, until new council members took office late in the year. (See the Journal's coverage here.) 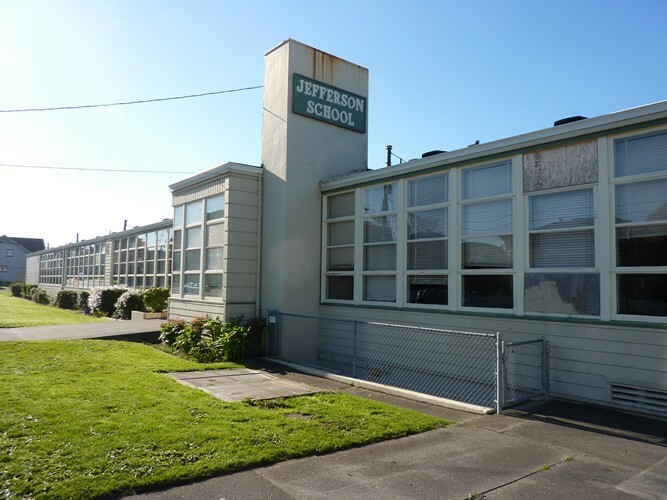 Left in the lurch, the community group rounded up its own funding and purchased the property from Eureka City Schools last April by submitting an uncontested bid of $610,000. In his own press release, Assemblyman Wes Chesbro (D-Arcata) congratulated the group. "This grant will directly benefit all of Eureka, not just the West Side," Chesbro said. "The community owes a huge ‘thanks' to Heidi Benzonelli, president of the West Side Community Improvement Association, and the Redwood Community Action Agency, who worked so hard to complete a successful grant application on a short deadline." The Westside Community Improvement Association (WCIA) and Redwood Community Action Agency (RCAA) have been awarded $3,305,560 from the California Department of Parks and Recreation, Office of Local Grants and Services. The funding from the Statewide Parks Program of Proposition 84 will enable the development of the Jefferson Park and Community Center located at 1000 B Street in Eureka, CA. This will enable WCIA to pay for the purchase of the parcel, and for RCAA to manage the construction of a playground, community garden, walking paths, basketball court, bocce court, open space and landscaping, and ADA-compliant restrooms and parking. It will also allow for the renovation of existing buildings into a community library, multi-purpose room, infant/toddler center, community recreation room, kitchen and restroom. WCIA board president Heidi Benzonelli said "Westside Community Improvement Association is grateful to have the opportunity to make such a difference in our community. A new public park and community center will restore common-ground to the Westside. "The Westside Community Improvement Association grew out of a citizen's group known as the Jefferson School Committee. WCIA spent six years developing broad community support to restore the abandoned Jefferson Elementary School to once again become the hub of the Westside neighborhood. RCAA executive director Val Martinez said that: "We are very pleased that the Parks and Recreation Department recognized that this is a necessary and important project for Eureka's citizens, and in particular the residents of the Westside community." The Westside Community Improvement Association and Redwood Community Action Agency wish to thank First District Assemblymember Wesley Chesbro and State Senator Noreen Evans of the 2nd District for their support and shared vision for this project. Chesbro, a former member of RCAA's Board of Directors said, "This project is a tremendous example of how community partnerships can work for the greater good and demonstrates how community action agencies are leaders in creating these solutions." For more information contact the Westside Community Improvement Association at (707) 444-2988 or P.O. Box 5315, Eureka, CA 95502; their website: http://jefferson-project.org/ or their Facebook page at http://www.facebook.com/Jefferson.Project.